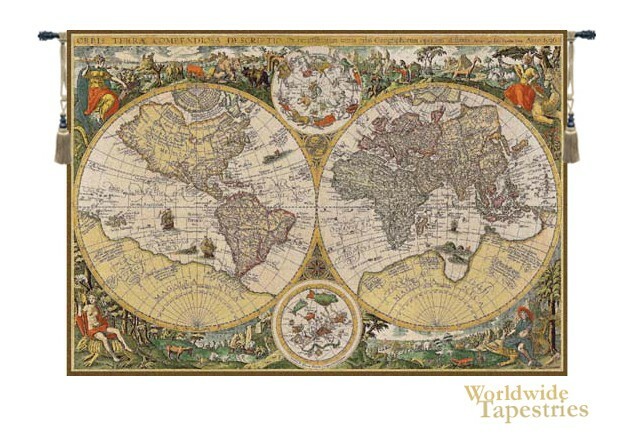 Orbis Terrae tapestry depicts the world as those in the late 16th Century would have understood it. Created by Flemish map engraver Jan Baptist Vrients in 1596, it shows the continents of Europe, Asia, Africa and America, each represented in the four corners by the animals and peoples known to inhabit each land mass. This is the first of several such maps, which were also known as Beatine or Beatus maps, created by Vrients between 1596 and 1612. Known as a T-O or O-T (obris terrae, or literally circle of the earth), Jerusalem was generally represented as the center of the map. The four sacred rivers in the Holy Land were always depicted. Orbis Terrae tapestry is lined and has a tunnel for easy hanging. Note: tapestry rod and tassels, where pictured, are not included in the price. Dimensions: W 56" x H 38"
Dimensions: W 82" x H 56"
Dimensions: W 112" x H 76"